My Blogs: MR. D.I.Y. IS NOW ONLINE! MR. D.I.Y. management with Adibah Noor & Social Media Influencers. I am sure most of us know about MR. 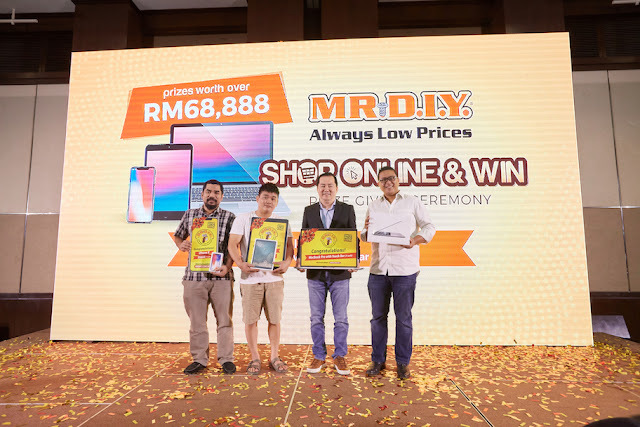 D.I.Y., Malaysia’s largest home improvement retailer with more than 550 stores across the Asia Pacific. There is good news now that MR. D.I.Y. 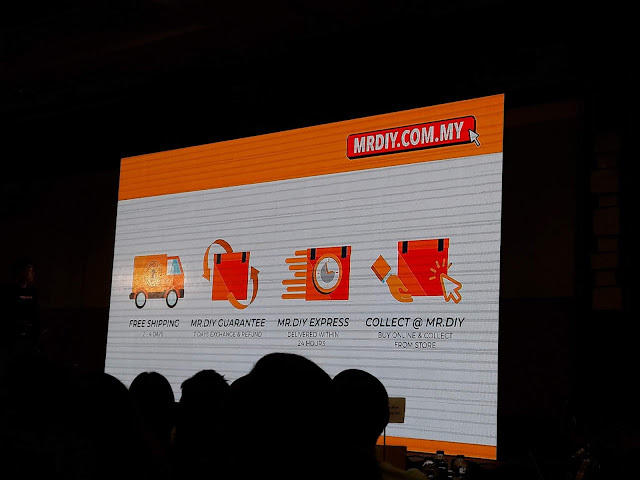 has launched its highly anticipated E-commerce platform, mrdiy.com.my recently at the InterContinental Hotel Kuala Lumpur. I love to shop at MR. D.I.Y. because all their things are so affordable, some are considered very cheap. Now I am sure everyone would be jumping for joy because of the launch of its online shopping. It is a trend that more and more people shop online because it is more convenient, you can shop anytime you like with just a few clicks on your mobile phone or tablet. 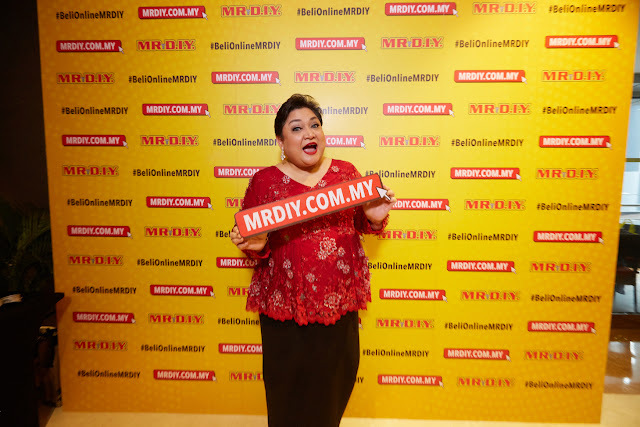 The launch event was attended by MR.D.I.Y.’s brand ambassador Adibah Noor whose face can be seen on MR.D.I.Y. advertisements since 2017. During her first year, MR.D.I.Y. 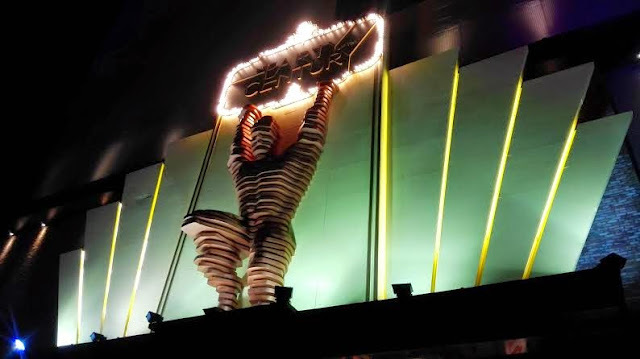 launched its campaign with the bold tagline ’Nasib baik tak beli tadi! MR.D.I.Y. murah lagi!’. This year, Adibah endorsing MR.D.I.Y.’s new tagline 'Habislah... MR.D.I.Y. 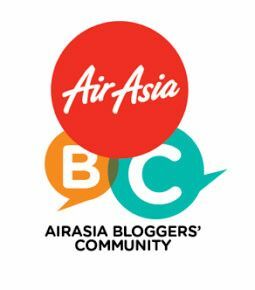 Boleh Beli Online!’ Other guests seen at the event included key opinion leaders such as Faizdickie, Rose Nicotine and Intan Saleh, along with bloggers, members of the media and invited guests. During the presentation, guests were introduced to the four key features of the MR.D.I.Y. online store, namely Free Shipping, MR.D.I.Y. Express delivery within 24 hours with a small fee, Collect @MR.D.I.Y. and the MR.D.I.Y. Guarantee 7 days return/refund to any MR. D.I.Y. outlets. MR.D.I.Y.’s E-commerce platform that will reach a wider network of clientele as well as to share the goals and vision of the brand for the future. Customers can enjoy free shipping to their homes within Peninsular Malaysia with no minimum spend required for any order below 5kg. For a small fee, customers in Klang Valley can also request for express delivery where their purchases will be delivered to them within 24 hours. With Collect @ MR.D.I.Y., customers can purchase an item online and collect it in person from any of selected 25 stores within the Klang Valley. And finally the MR.D.I.Y. Guarantee means that customers who purchase on the MR.D.I.Y. online store will have seven calendar days to return the item(s) to be exchanged or refunded subject to terms and conditions. 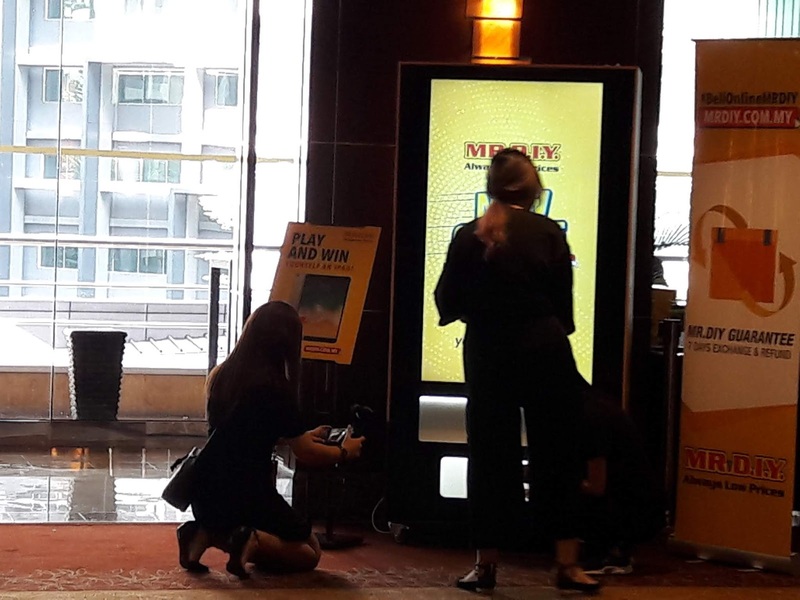 Guests were welcomed and walked through the website interface and features to give them a feel and a firsthand experience on the new MR D.I.Y. E-commerce platform. They also had the opportunity to pose for photos at the interactive photo booth and “Grab MR.DIY” mini game vending machine to receive a shopping voucher redeemable on the website and stand a chance to win an iPad. In his address, MR.D.I.Y.’s Head of Marketing & E-commerce Mr Andy Chin said, “We are very excited about the recent development of events. MR.D.I.Y. 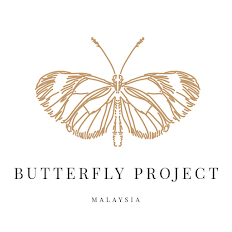 has progressed rapidly to become a regional brand with regards to the number of stores implemented throughout Malaysia and other countries. This E-commerce platform points to another progression – that of keeping up with the times and also being a pioneer in the way business is conducted in this region,” enthused Chin. “With MRDIY.COM.MY, we will be able to cater a diversified market of tech savvy individuals who never had time or not interest to visit physical stores. Aside of that, we are also aiming to provide a convenient shopping solution to help solve a lot of our customer’s problems – such as those who want to buy in bulk, urgent purchases, limited mobility as well as cost-saving concerns when it comes to petrol and parking fees. Customer can also send gifts to their family and friends when they shop with us online. At MR.D.I.Y., we offer solutions to ease your problems,” he explained. MR.D.I.Y. stores carry more than 20,000 types of products across nine departments -Hardware, Household, Electrical, Car Accessories, Stationery, Toys, Gifts, Sports and Jewellery & Cosmetics. Their tagline, “Always Low Prices”, to promote the brand value of affordable pricing has been successful in garnering 128 million customers per annum, which continues to increase by leap and bounds. 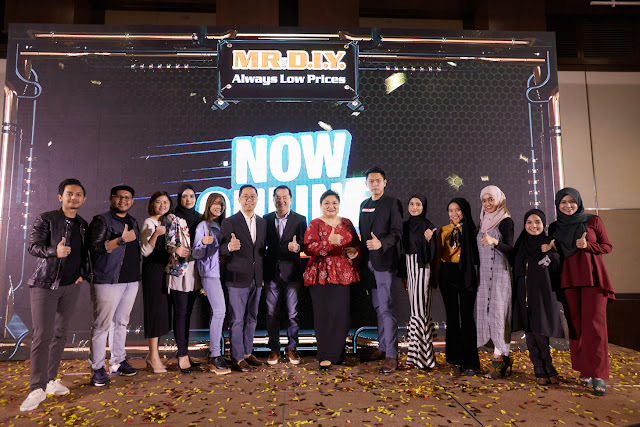 MR.D.I.Y., a home-grown enterprise with over 550 stores throughout Malaysia, Thailand, Brunei and Indonesia, continues to grow successfully in Asia-Pacific. “2018 is set to be a prosperous year for MR.D.I.Y. as we have four major goals to achieve. Our first goal is to open a Flagship store and now, we are the proud owner of MR.D.I.Y.’s 1st Flagship store in MidValley Megamall. Secondly, we will be expanding our reach to two new countries - Singapore and Philippines in Q3 & Q4 respectively this year. Thirdly, we are planning to open an additional 300 new stores across the Asia-Pacific including Thailand, Brunei and Indonesia; And finally, the reason why we are here today – to celebrate the launch of the MR.D.I.Y. E-commerce platform,” Chin added. As an introductory promotion from June to August 2018, shoppers who purchase from the website will enjoy RM5 off on their first purchase with a minimum spend of RM10, in addition to the free shipping. Aside of that, all successful online transactions during the contest period will enter a lucky draw where they stand to win over RM68,888 worth of prizes. 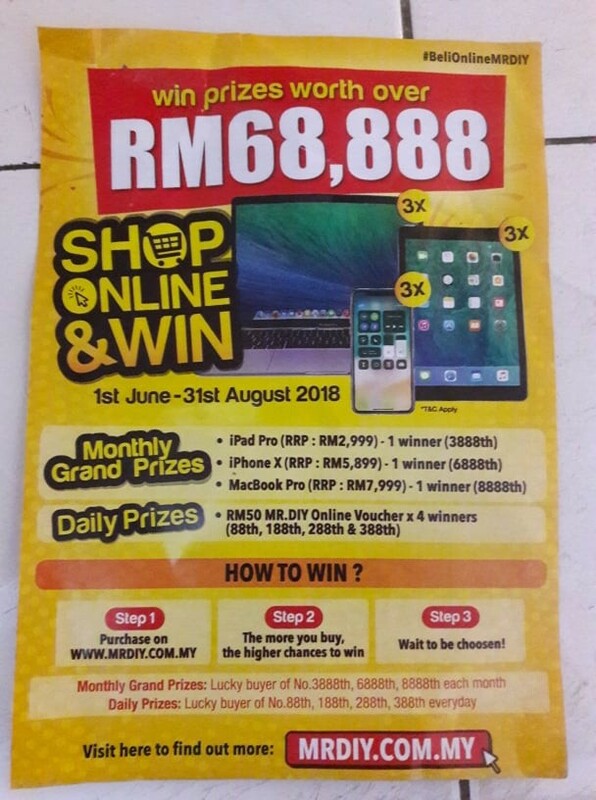 The exciting monthly grand prizes include an iPad, an iPhone X and a MacBook Pro on every month starting June, July and August 2018. Meanwhile, additional four (4) lucky winners will stand to win daily prizes consisting of MR.D.I.Y. vouchers worth RM50 each on selected purchase orders. For the month of July 2018, MR.D.I.Y. will be collaborating with P&G to offer exclusive P&G products with offers of up to 35% off in all stores and online. These selected items are the best value that you can find in the market. P&G is the largest consumer products company in the world with market leader brands such as Downy, Joy, Dynamo, Oral-B, Pantene, Rejoice, Gillette, and Head & Shoulders. To spice things up, MRDIY.COM.MY also offering smashing deals online with discounts up to 40% for brands such as MR.D.I.Y. house brand, as well as other reputable international and local brands like WD-40, Shamood Anakku, Coido, OHOYO, Pritech, Staedler, GAP, IVON and Eveready. Guests were also informed about an on-going contest held from 1 st June to 31st August 2018 in order to encourage online shopping on the MR.D.I.Y. platform.